Spear is a Luke Cage villain. He is known for killing Doctor Burstein the Doctor that gave Luke Cage his powers. Jack Daniels is a convict with a critical illness who is experimented on by Doctor Burstein. Instead of curing Jack the experiment causes Daniels to die an agonizing death. Both of Jack's brothers seek vengeance against Burstein and look for ways to become super villains. One of the Daniels brothers becomes the Mangler the other becomes Spear. 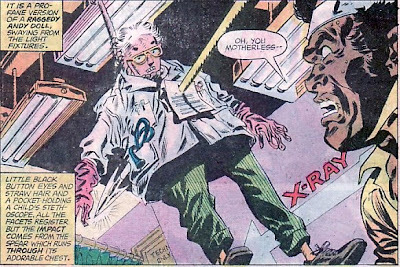 Later Burstein does the experiment that gives Luke Cage his powers. After Luke Cage escapes prison Dr. Burstein follows him and sets up a clinic to help people near Cage's office. He believes in Cage's innocence and becomes an ally. When the Daniel brothers come after Burstein, the Doctor recognizes them. Luke tries to protect the Doctor but fails. The Doctor is given a note by the Spear for a meeting. The Doctor feels guilty for what happened to their brother and agrees to meet them. He killed by a spear right before Luke Cages eyes. After a long battle Luke Cage manages to subdue the Spear where he goes (temporarily) into police custody. Spear is an expert marksman and very a very good fighter. He uses a special spear gun that can fire a variety of different types of Spears. Some Spear shafts are simply spears, other shafts explode, others release gases, some simply carry messages. 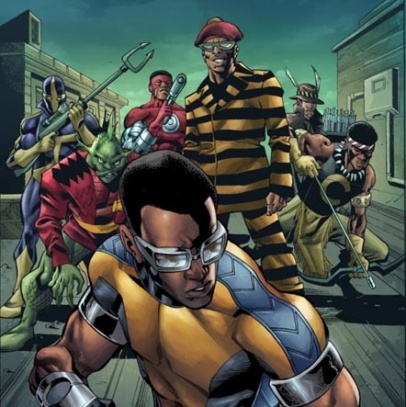 Spear later show up in the Flashmob group in an attempt to beat Luke Cage.